Have you ever seen a baby crying on a street? Thinking that it was being abandoned or left by its parents because it was already crying and no parents are taking care of it? Now be aware that before you watch on a crying baby, think first that maybe it was a prank that while trying to help baby it will turn to an “DEVIL BABY” with a scary voice and face. Just like on a viral video that scares people in New York City. A remote controlled baby with a devil looks is inside the stroller and being controlled by Thinkmodo group. An animated Devil Baby have character that can cry just like a baby, headbang, vomiting and sounds like a demon, baby sound like a possessed person needing people to be afraid when it suddenly stand over you while you are trying to help a sweet baby crying. 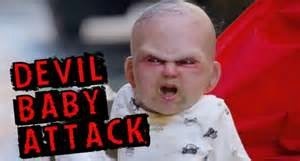 By doing this prank the most important to see is the first second reaction when suddenly a Devil Baby comes. You will see the different reaction of every individual in this very rare case, how they approach when a situation came.